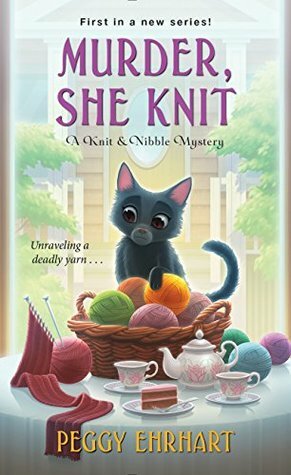 Murder, She Knit by Peggy Erhart is the first in the Knit and Nibble series. Pamela is a widow who is getting ready for her daughter's first visit home from college. It's also her turn to host the Knit and Nibble group meeting. After everyone has left, she finds a body in her bushes. She turns sleuth, and with her best friend Bettina, sets out to find the killer. I enjoyed the first book of this series. It takes place in a small town setting. Pamela is a strong, relatable character that is determined to carry on with in life with her daughter. She can take other people's trash and make them her treasures. Bettina is her best friend and neighbor. She's a quirky character and is ready to help Pamela figure out the clues at the drop of a hat. She lends herself well to the story, and together they make a great team. The mystery was a wonderful page turner. When I thought I had it all figured out, the author would throw in a clue with a twist and I'd have to start again. It kept me going until the end. This book is filled with fun, quirky characters and a mystery that will keep you guessing until the end. I can't wait to see what excitement the second book holds. I suggest you pick up this book and check it out. You won't be sorry.